New Mum Online: Tesco. The Good, the Bad and the Ugly. Tesco. The Good, the Bad and the Ugly. well I feel obliged to follow up on this post because it had so many page views and because a few of my blogger friends copied me and placed an order too. It was far too good an offer to miss out on. It all arrived yesterday morning. Was very impressed with that. It further impressed me (again after the excitement of placing the order that lead to the post in the first place) that I got a bundle this large for £37 (including a two-pack of formal shirts for hubby). Hubby was delighted as he thinks baby clothes are over-priced so he was very happy to see my bargains. The daddy shirts are lovely. I had a VERY funny moment yesterday morning where I was getting ready to meet a fellow blogger for coffee, and Aaron had my favourite jumper on (Boots) and I ran around trying to find something for the bottom half. I put on blue trackie bottoms and they were so creased I was mortified. I thought OMG when I meet my blogger friend my first words are gonna have to be, excuse Aaron's trousers. Then I knew I couldn't start a lunch catch-up LIKE THAT! Rummaged through the Tesco bundle to discover that the 2-piece set I got had blue trackie bottoms as a bottom half. On the face of it they were identical to the Boots ones BUT when I got them out of the packaging they were much thinner. I didn't mind for 3 reasons. (1) they're part of the Spring Summer range AND (2) they were a fifth of the price and (3) they were crease free LOL. There won't be An Ugly section. Just sounded good as a subject heading, but now onto THE BAD. This is where Tesco has really let me down and I feel like a bit of a fool. Given that I bought a lot of clothes for going to Ireland, I felt I should get some staples in the order, not just clothes (which he grows out of so quickly) so I got some sensible vests and sleepsuits. I only bought 1 three-pack of 9-12 months sleepsuits for Ireland as he was still technically fitting into 6-9 month ones for some reason. Anyway they are all too short in the arms now. So I bought the only pack of sleepsuits I could find (there are lots of "new" ones now), and because I need a good few I bought the 2-pack THREE times. I'll leave this bullet point for now as the fact that I now have 6 of them is a BAD enough point in itself. If you are still with me??? onto the second BAD point and the main reason for this blog post. The Disney theme on these sleepsuits is DUMBO :-( And they have the word DUMBO written ALL OVER THEM. D in red U in yellow M in blue B in red and O in green. Now I am a BIG FAN of Masaru Emoto, so covering my baby in the word Dumbo is no joke. Sorry, the page you're trying to reach may have moved or no longer exists. Huummmphfff I am not surprised!!!! And the description gives you NO IDEA!!! or does Maire mean Dumbo???? Please tell me it's all been a joke and it's 1st April???? 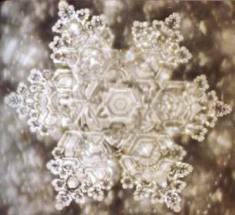 If water crystals look as special as this when subjected to the word love, what will happen to my Son, sleeping, surrounded in the word Dumbo. Sorry you didn't get quite what you were expecting but your post did make me laugh :) Bless you. I was really pleased with my order - everything hanging up in baby's wardrobe now, still with the plastic covers on. It looks lovely! Wendy I left a post on the tesco clothing blog, but although they visited mine, my post didn't get passed moderation. Qwerty it was intended to be funny (with a bit or satire and irony), so I am glad I made you laugh - tee hee. But... if Tesco would like to send me some more... 9-12 months in a nicer - less politically incorrect - design, then these will go to the charity shop, and I will welcome new ones with open arms. Oh no, mortifying! I don't like Tesco sleepsuits as I find them really thin, fine in summer but not any other time of the year. How awful that you were relying on them amd it let you down. hanks for linking up to ShowOff ShowCase.